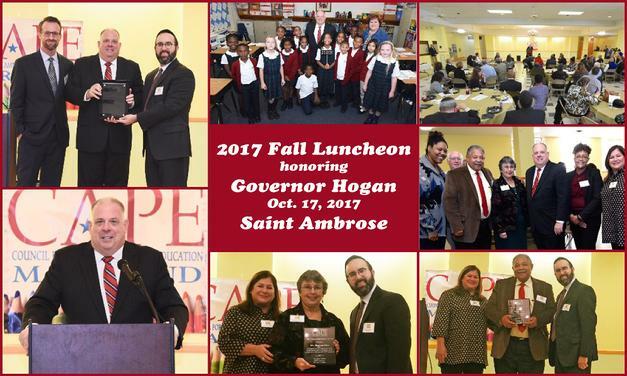 Cheverly, MD - Oct. 17, 2017 - Maryland CAPE (Maryland’s state chapter of the Council for American Private Education), the coalition which represents Maryland's nearly 1,400 nonpublic schools, presented Governor Larry Hogan with its 2017 Champion of Education Award on Tuesday. The event marked the fourth time the award has been given. The award, whose recipients represent a bipartisan group of Maryland elected officials committed to providing the best educational options for all of Maryland's school children, was given prior to the Governor's visit to his childhood elementary school, the Saint Ambrose Catholic School in Prince George’s County. The event also featured the presentation of the 2017 Civic Achievement Awards to Ms. Barbara Bice and Mr. Jim Clark, two recently-retired employees of the Maryland State Department of Education who worked for many years on programs that were beneficial to Maryland’s nonpublic schools. Rabbi Ariel Sadwin, President of Maryland CAPE and Director of Agudath Israel of Maryland commented, "it was a true honor to present this award in recognition of Governor Hogan's dedication to the educational success of all of Maryland's children". On Monday, October 7, 2013, the Maryland chapter of the Council for American Private Education (Maryland CAPE), held its inaugural Fall Meeting, gathering administrators from a large collection of the state's nonpublic schools, as well as Maryland state education officials. The event was hosted on the beautiful campus of the Annapolis Area Christian School (AACS), in its Kerr Center for the Arts. With close to 100 attendees, it marked the largest event of nonpublic school administrators in recent memory. The event began with words of welcome from Mr. Rick Kempton, superintendent of Annapolis Area Christian School, followed by a heartfelt prayer. After finishing his words with an invitation for a post-meeting tour of the beautiful campus, Mr. Kempton called up the president of Maryland CAPE, Rabbi Ariel Sadwin, to begin the program. Rabbi Sadwin extended greetings to the many new attendees at the event and shared the vision of Maryland CAPE and its continued revitalization of nonpublic school advocacy activities to maximize the benefits of working as a strong and engaged entity. Rabbi Sadwin then called upon the special guest presenter, the renowned education consultant, Ms. Michelle Doyle. Ms. Doyle is a former director of the U.S. Department of Education's Office of Non-Public Education, who lectures around the country on the topic of federally available education programs. She focused her presentation on the required "equitable participation" school districts must provide to the nonpublic schools in their area of operation, sharing the benefits of the federal programs, like Title I and other similar programs. Ms. Doyle provided many useful tips and resource materials to help the schools ensure that they are receiving their maximum benefits (the links below will allow you to download the materials that were shared). After Ms. Doyle's keynote presentation, Rabbi Sadwin introduced the gathered to Mr. Garrett O'Day, Esq., the recently appointed associate director of the Maryland Catholic Conference. Mr. O'Day addressed the crowd on the topic of the renewed efforts to pass the Maryland Education Credit legislation. The bill, formerly known as the BOAST Tax Credit, seeks to create the mechanism by which corporate tax credits will generate nonpublic school scholarships for low-income students. The event continued in the Center's spacious bandroom with a delectable lunch, where the gathered was addressed by event sponsors. Mr. O'Day continued the program by presenting a workshop to assist the gathered schools in the filing process for state grants recently made available by the legislature for school building improvements and security upgrades. In attendance was Ms. Barbara Bice, MSDE's (Maryland State Department of Education) chief of the School Facilities Branch and director of the aging schools grant program, who provided individualized assistance to many of the gathered school administrators. The last presentation was delivered by Dr. Mary Ellen Hrutka, vice president of Maryland CAPE. Dr. Hrutka presented a wide array of cost-cutting options for nonpublic schools to utilize. The list of items available to be purchased at a fraction of the cost as a consortium ranged from commonly used school supplies to utilities such as energy consumption - all made available to the nonpublic schools, to assist in managing their school expenses. Rabbi Sadwin closed the event by acknowledging the graciousness of the hosts, the expertise of the presenters, and the participation of the attendees in making the inaugural Fall Meeting of Maryland CAPE such a success.